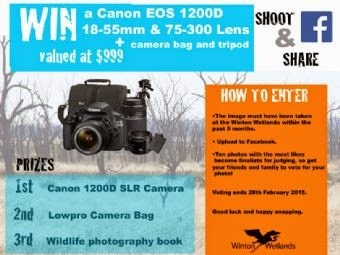 Capture your impression of the Winton Wetlands and share it with us and you could win a Canon EOS 1200D SLR Camera kit worth $999. Competition runs from Monday 2 Feb to Saturday 28 Feb, 2015. Photos can feature the unique wetland landscape, people enjoying the natural wetland environment or even some of the wildlife that can be found out on the wetlands. The choice is yours. 1st Prize Canon EOS 1200D w/18-55mm, 75- 300mm & 50mm Lens Digital SLR Camera w/Bag, Tripod & Battery, valued at $999. 2nd Prize Lowepro Camera Bag. 3rd Prize Wildlife Photography book by Australian Photographer,Steve Parish. Learn how to photograph mammals, insects and water birds. The image must have been taken at the Winton Wetlands within the past 6 months. The image must be your own photography. The image must not contain any offensive material. No filters or heavily edited photos. Images must be JPEG (.jpg) images. Submissions must include the location name of where the image was taken at Winton Wetlands. Entries must comply with the General Terms and Conditions. Ten photos with the most likes become finalists for judging, so get your friends and family to vote for your photo! Photos must be uploaded one week before the end of the month (we will keep you updated on Facebook); there will then be one additional week of public voting until the last day of the month. The winner will be announced in the first week of March on Facebook. The 10 images that receive the highest number of Facebook ‘likes’ during the specified public voting period will then become our finalists. Professional photographer, Rene Martens and a member of the Winton Wetlands Committee of Management will judge the finalists to select the three prize winners. The winners of the competition will be announced on Friday 6 March, 2015. Please read the full competition terms and conditions before entering.